This is a multi-pack consisting of TWO 16 ounce containers of Sunsweet Amazin Pitted Prunes (Dried Plums). These prunes are plump, juicy and delicious. Sunsweet is a leading prune producer (as well as many other dried fruits). Check out the nutritional label for details. Prunes are a great fiber source. KEEP one can in the car, at home, at the office, school, etc. Great anytime snack! PLUS: We include a special prune recipe with your order. Get yours today and as always, thanks for shopping! 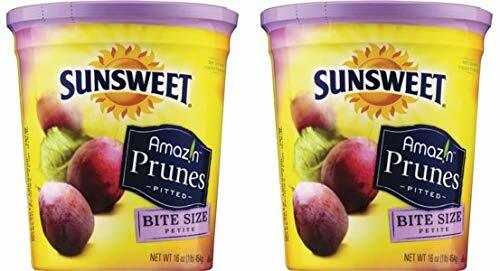 GREAT VALUE: This is a multi-pack consisting of TWO 16 ounce containers of Sunsweet Amazin Pitted Prunes (Dried Plums). QUALITY: These prunes are plump, juicy and delicious. SUNSWEET: Sunsweet is a leading prune producer (as well as many other dried fruits). KEEP one can in the car, at home, at the office, school, etc. Great anytime snack! NUTRITIONAL: Check out the nutritional label for details. Prunes are a great fiber source. PLUS: We include a special prune recipe with your order.